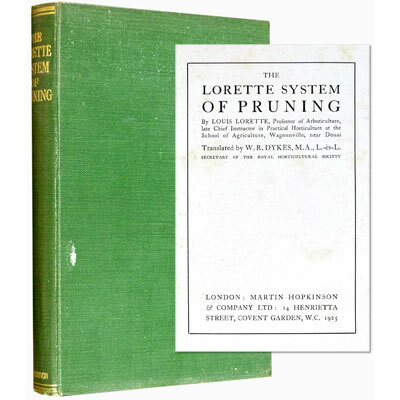 The Lorette System of Pruning - Louis Lorette, W.R. Dykes [Translator] 1925 - Martin Hopkinson & Company Ltd., London - First Edition in English	The classic work which revolutionized the pruning of fruit trees, rare in first edition and such nice condition. Illustrated with diagrams and photographic plates. ‘Louis Lorette was curator and professor at the Lycee Agricole in the district of Douai in France at the turn of the 20th century. Lorette noticed as a young man that well trained trees, pruned carefully each winter, produced much less fruit than standard trees that were left unpruned. Around 1898, Lorette began a series of experiments that showed that apple and pear tree buds formed at the base of a branch are more productive than those formed farther up the branch. In 1912, an article was published in the French gardening magazine Jardinage describing a new pruning system for apples and pears that had resulted in huge crops without the usual winter pruning. Crowds of people turned up at the school to see for themselves, 3,000 that first season. The Lorette Method was controversial since it went against the establish rules of Pruning Science. In 1925, the first English version of Lorette's book was published. 1. Don't prune in the winter, except for removing main branches from the framework of the tree. 2. Don't prune until around the middle of June. At this point in the season, leaves and new shoots are almost fully mature. 3. Only remove branches when they are pencil thickness. Makes cuts almost to the base of the branch. Fruit spurs will form as a result where each year fruit will form.